This is an age of strife and sorcery. An age of might, splendor, and decadence. In this age, powerful kingdoms fight for supremacy in the Hyborian world. Using armies, magic, and intrigue, these nations strive to expand their borders and increase their riches. Command the legions of imperial Aquilonia, the witches and monstrous creatures of frozen Hyperborea, the sorcerers and demonic servants of dusky Stygia, or the horse-hordes and cunning diplomats of the plains kingdom of Turan. Into this age of empire building, heroic achievements, and vile misdeeds steps Conan the Cimmerian – black-haired, sullen-eyed, sword in hand, a thief, a reaver, a slayer, with gigantic melancholies and gigantic mirth, to tread the jeweled thrones of the earth under his sandaled feet. 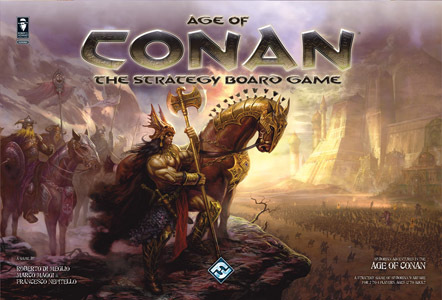 Age of Conan is a board game that puts players in control of one of the major kingdoms of the Hyborian age, a period of history well known through the tales of Conan the Cimmerian, the barbarian hero created by Robert E. Howard. Players fight with armies, sorcery, and intrigues to make their kingdom the most powerful of the age, and to secure for their side the mightiest hero of all – Conan the Cimmerian! 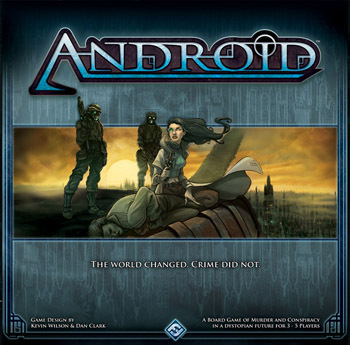 Android is a board game of murder and conspiracy set in a dystopian future. Detectives travel between the city of New Angeles and moon colony Heinlein chasing down leads, calling favors, and uncovering the sinister conspiracy beneath it all. The detectives must balance their pursuit of the murderer against their personal lives and inner demons. Android's innovative mechanics ensure that no two detectives play alike. Will you play as Louis Blaine, the crooked cop tormented by guilt and loss? Or will you take the role of Caprice Nisei, the psychic clone who struggles to retain her sanity while proving she's just as human as anyone else? Whomever you choose to play, you've got just two weeks to solve the murder, uncover the conspiracy, and face your personal demons. Better get moving, detective. Android is a game for 3-5 players and takes between 2-4 hours to play. #FFG AD01 - Price: $ 59.95 - $ 47.96 On Sale!